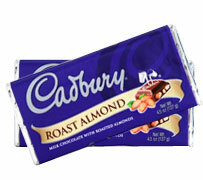 Cadbury Dairy Milk Roast Almond block is a delicious combination of roast almonds blended with favourite Dairy Milk, milk chocolate. Full cream Milk, Sugar, Almonds, Cocoa Butter, Cocoa Mass, Milk Solids, Emulsifiers (Soya Lecithin, 476), Flavours. May contain traces of other nuts. Milk Chocolate contain Cocoa Solids 26%, Milk Solids 28%.